Your responses to a previous question about another plant I have helped greatly. Thank you. Now I just became a little adventurous and bought an Anthurium from the Araceae family. I got it at Walmart and it looked absolutely healthy. Now 2 weeks later the white blooms are brown as you can see from the picture and the others are turning brown. What am I doing wrong? I have a light approximately 24 inches away from it during the day, because I get absolutely no sunlight, as I'm between buildings. Thanks again for any information you can give me about this plant. Thank you. Hoping to be a little green in NYC. I found anthuriums don't like to be too wet. I water once a week & I don't soak it - I just add a cup or 2 of water for a large plant. You can also check & see if it needs a larger pot. Anthuriums throw off small plants from the base. When you see one that are 3+ inches high, you can dig out & repot. Mine does not get any direct sun, but lots of light - sometimes under a flourescent bulb. I find they are slow growers. Good luck with yours. 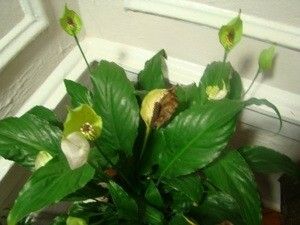 The plant is not an anthurium it is a Peace Lily . Spathiphyllum cleans indoor air of many environmental contaminants, including benzene, formaldehyde, and other pollutants. It cleans best at one plant per 10 m². It lives best in shade and needs little sunlight to thrive. It is watered approximately once a week. The soil is best left moist but only needs watering if the soil is dry. You can put a search in google and find more information on this plant. Sometime if there is a high content of salt in your water source you will also get the brown edges. if this is the problem it is good to leach at least once a month and add new soil as the soil level gets lower from the excess leaching. This plant looks like a Peace Lily. They need low light, which is good for a room with little light. The Peace Lily is not a good one to have around cats. It is toxic to cats. I believe it is a member of the Lily family, and any plant in the Lily family is not good around animals that might be tempted to eat a part of it. Let your water sit overnight before watering your plants. That way if there is chlorine or anything else in your water, it will evaporate. Stick your finger in the soil to determine if it is dry and needs watering. Lots of luck with your Peace Lily.